Setting to me is as important as the characters. This is the home where everyone is going to live and love, and possibly die…but don’t go keeping a body count! 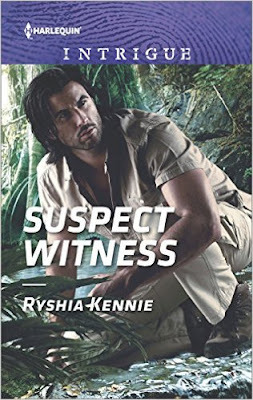 While I’ve published other romantic suspense novels, Suspect Witness is special because not only has it just become available, it’s my Harlequin Intrigue debut! Set in Malaysia, the setting was easy to bring alive as I’d travelled to Malaysia and to the Gunung Mulu National Park and their massive caves that become in Suspect Witness, a place for my characters to run amuck, to fear- to flee and maybe - to love. She had been pretty once. Now her skin gleamed in the glow of the fluorescent lights. A strand of auburn hair fell across a well-shaped brow and her lips held a glimmering trace of sherbet lip gloss. "It's a shame, really," the coroner said as his sun-bronzed hand held the edge of the stark white sheet. "Life was just getting started. Twenty-five or there about." He shook his head. "I try to remember that every time I step out of the house. Enjoy the moment. You just never know. And in this job you're reminded of mortality every day." A strand of salt-and-pepper hair drifted across his forehead. "I try not to think about it or it would drive me crazy." "True," Josh Sedovich said. "Any idea how she died?" The coroner nodded. "She was hit by a blunt object to the back of the head. Surprising, I always thought Singapore so civilized until I moved here and took this job. Unfortunately, it's turned out no better than anywhere else." "Why does it always end like this? On a temporary visa to see the world and, just like that, it's over." Josh ran his hand along the side of his neck. "It's damn hot in here." "No air-conditioning," the coroner said. "Is she who you're looking for?" "No. Fortunately not." He fisted his right hand. Not so fortunately for the unknown young woman on the coroner's slab. Ryshia Kennie is the award-winning author of her city’s writing award and a semi-finalist in the Kindle Book Awards. There’s never a lack of places to set an edge-of-the-seat suspense as prairie winters find her dreaming of warmer places for heart-stopping stories. Settings with deadly villains threatening intrepid heroes and heroines, who battle for their right to live or even to love, in a place that neither - or both, may call home. Glad to be here. I'm downstairs in my office right now with a blanket around my knees. It's a chilly Valentine's morning here on the prairies and just after eight o'clock in the morning. But I'm raising my coffee cup - cheers to a beautiful Valentine's Day no matter how you choose to celebrate. It seems right that today I'm writing a love scene for my latest book. My hero and heroine are caught in a dust storm in the Sahara. A tent, just the two of them... well, you get the picture. Later I'll have supper cooked by my husband, who's a fantastic cook or is that chef, and a glass of wine to celebrate the day. Do you celebrate the day... and if so how?